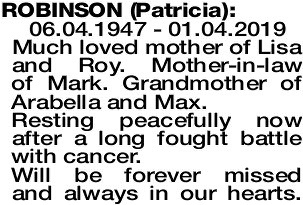 06.04.1947 - 01.04.2019 Much loved mother of Lisa and Roy. Mother-in-law of Mark. Grandmother of Arabella and Max. Resting peacefully now after a long fought battle with cancer. Will be forever missed and always in our hearts. 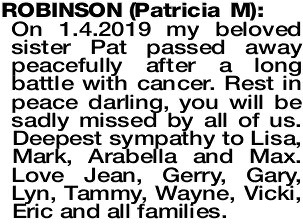 The Funeral Cortege for Mrs Patricia Robinson of Subiaco will arrive at the main entrance of KARRAKATTA Cemetery, Railway Road, Karrakatta at 2pm on TUESDAY (9.04.2019) for a Cremation Service. 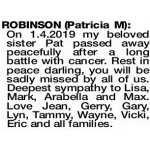 On 1.4.2019 my beloved sister Pat passed away peacefully after a long battle with cancer. Rest in peace darling, you will be sadly missed by all of us. Deepest sympathy to Lisa, Mark, Arabella and Max. Love Jean, Gerry, Gary, Lyn, Tammy, Wayne, Vicki, Eric and all families. 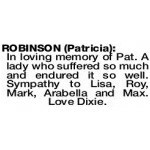 In loving memory of Pat. A lady who suffered so much and endured it so well. Sympathy to Lisa, Roy, Mark, Arabella and Max. Love Dixie. Pat, you were a very special friend and very dear to my heart. The world is far richer "because you were here". I will miss you my friend. Rest in peace. 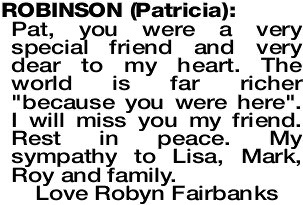 My sympathy to Lisa, Mark, Roy and family.